This display has moved on to Rochester NY. Here's an article and here is the Strong National Museum of Play website. *Faints* Man, if only I lived in New York...the Castle is beautiful! 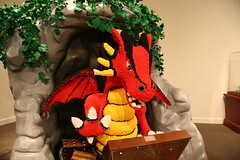 The LEGO Castle Adventure exhibit is currently in Waco Texas at the Mayborn Museum until September 12, and then will move to the Space Center in Houston for the fall months. So our Texas members will have a couple of chances to visit this display. BTW, is it just my poor memory, or is that knight sculpture in the middle above new? I wonder if they are continuing to add new exhibits to this traveling display. Oh, wow. We love going to children's museums, and this would make it even better... for me, at least. Here's the schedule for the traveling exhibit. Looks like the closest locations for you will be Portland in Fall 2011 and Vancouver in Winter/Spring 2012. Given your proximity to Canadian locations (well, at least you're a lot closer than I am), you might also check out the traveling Wheels, Wings and Waves show that is right now in Calgary and then will move to Edmonton. Bruce N H wrote: BTW, is it just my poor memory, or is that knight sculpture in the middle above new? I wonder if they are continuing to add new exhibits to this traveling display. I had to check my pictures, so my memory isn't what it used to be either. 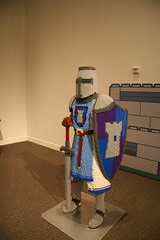 I can confirm, however, that the knight sculpture in the middle was included when the exhibit was displayed at the Museum of Play in Rochester, NY. Quick update - this display opens Saturday at the Space Center in Houston. oh Really? Any Idea on how long it will be on display? 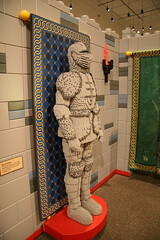 LEGO Castle Adventure is open now through January 23, 2011. I know, this is an old thread, but this display is still going strong. I see it mentioned on Twitter every once in a while as it moves from museum to museum. * It's in Baltimore at the Port Discovery Children's Museum for less than two more weeks, after which it's headed to the Mercer Museum about an hour north of Philadelphia. *BTW, follow @classic_castle . I regularly search Twitter for anything castle LEGO related and retweet what I find, as well as posting featured MOCs and other news from CC.